Corey is a student in Lawndale High, in the same year as Quinn. He has a few speaking roles, but otherwise he is mostly seen in the background of crowd and classroom scenes. 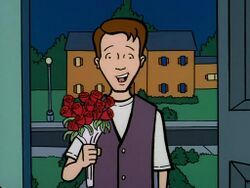 Corey holds the honour of being the first boy in Lawndale to ask Quinn to go out with him in the first episode "Esteemsters". Quinn states in "Love is a Way Too Many Splendored Thing" that "He has a special place in my heart, behind all the other guys who have nicer cars". We see him later in "Esteemsters" sitting in the auditorium with Quinn and an unnamed friend, making fun of Jane and Daria, only to be shocked when he finds out that Daria is Quinn's sister. He has the bad fortune of asking Quinn out when she has to write an essay in "Quinn the Brain", thus having the door slammed on his face when he shows up. He seems horrified at the idea that Quinn would do any work and may think that she is being held against her will. In "Daria Dance Party" Corey was one of Quinn's dates to the dance, where he tried to slow dance with her, only to be turned down. He later gets into a fight with the Three Js. This page was last edited on 23 April 2018, at 13:28.